Nisu Bread is a Finnish sweet bread. It is made with milk and sugar and flavored with cardamon. 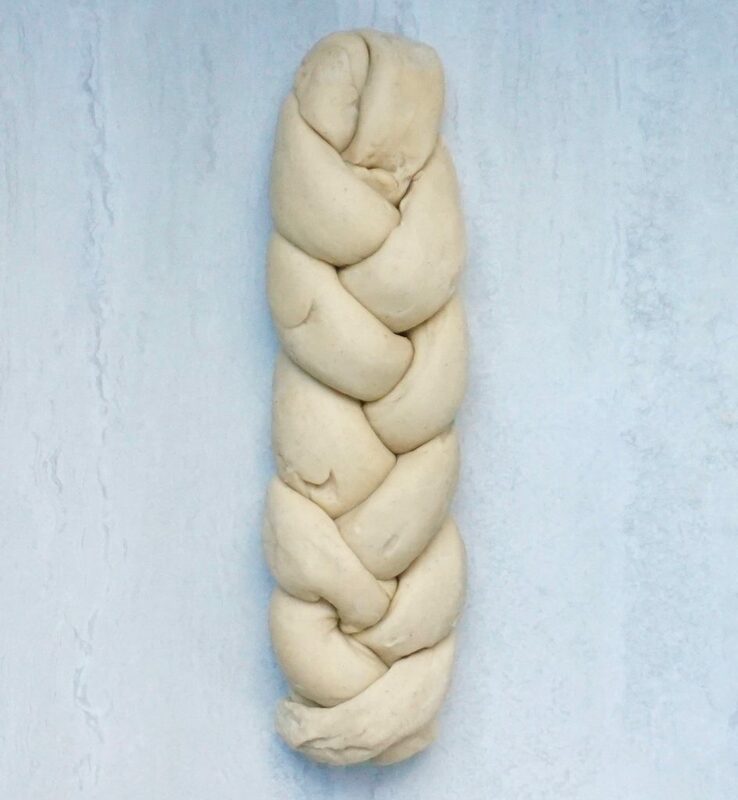 The dough is braided into loaves. Once it is baked it is drizzled with a confectionary sugar glaze. 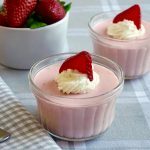 This is another one of my Mom’s recipes that I have been eating for Easter my entire life. 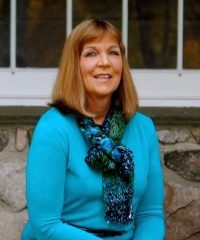 While we are not of Finnish descent, my Mom grew up in Rockport Massachusetts and there is a large Finnish community in that area. Nisu bread is commonly found there. This takes a bit of time and patience to make but it well worth the effort. Just make sure that you let the yeast rise fully at each step of the process. 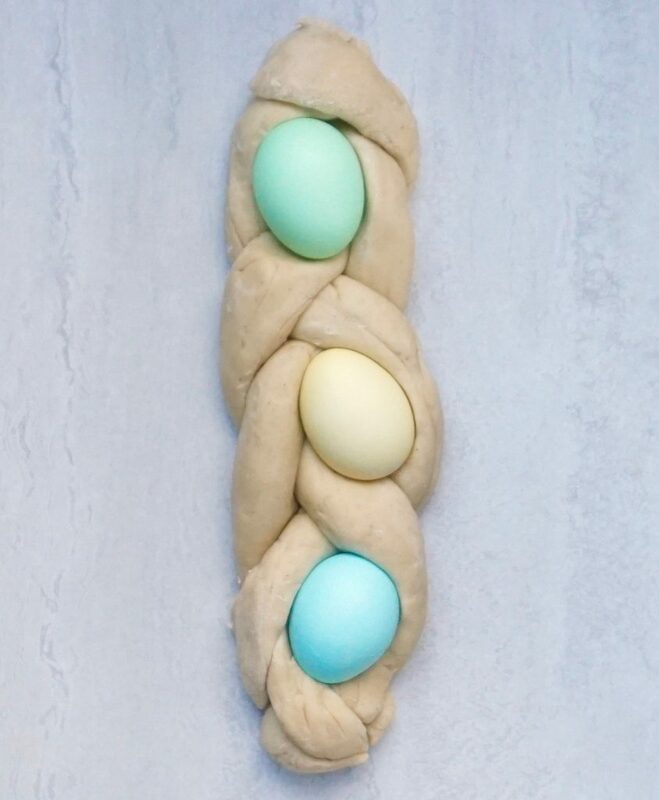 If you want to add colored eggs to the braid, it makes a pretty presentation for Easter. Pour the milk into a large saucepan. Over medium heat, bring the milk just to the boiling point but do not let it boil. Turn off the heat and add the butter. Stir occasionally until the butter is completely melted. Add the sugar and mix in well. Set aside and let the mixture cool to lukewarm. In a 2 cup measuring cup or bowl, add the warm water. Sprinkle the yeast over the water then add the 1 tablespoon of sugar. Stir to combine. Let the yeast mixture rise until it is triple in size. Beat the two eggs and add to the cooled milk mixture. Pour the milk mixture into a large mixing bowl. Add the yeast mixture and the cardamon. Start adding the first 5 cups of flour slowly, stirring into the wet ingredients. You are trying to achieve a pliable dough that is no longer sticky. Add additional flour, 1/2 cup at a time until this is achieved. You may not need all of the remaining flour. 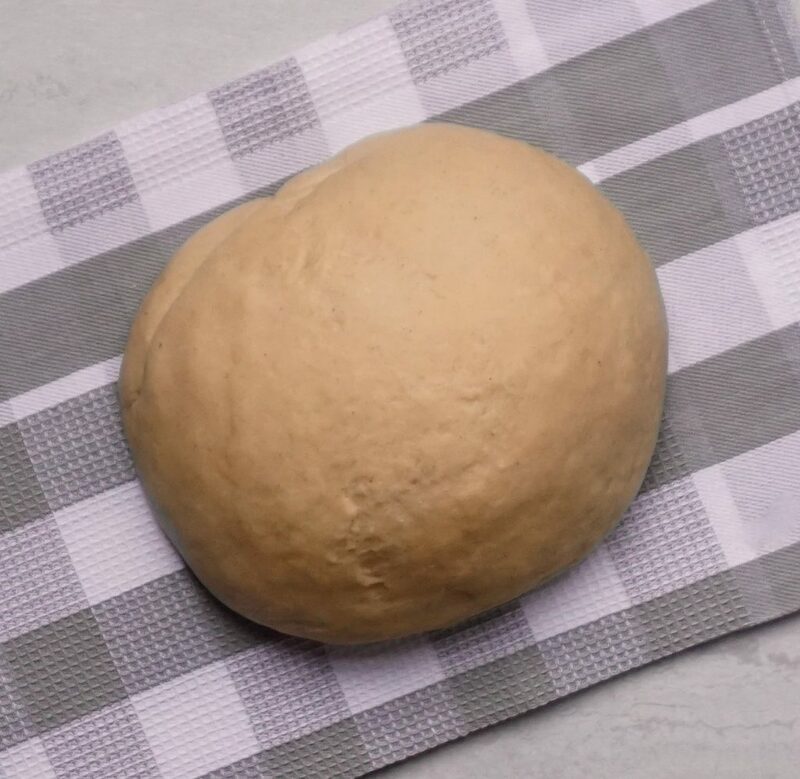 Move the dough to a floured board and knead the dough with the palms of your hands for several minutes. If you have a Kitchen Aid mixer, use the paddle attachment to mix the first 5 cups of flour into the wet ingredients. Remove the paddle and replace with the bread hook. 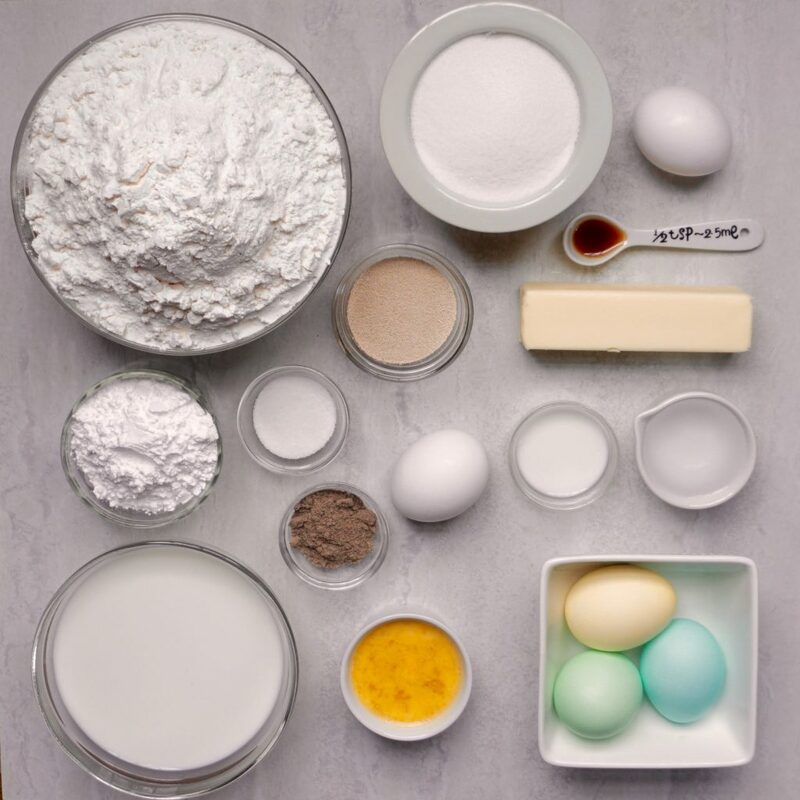 Adding 1/2 cup flour at a time, turn the mixer on and knead until your dough is no longer sticky. Keep the speed low. Grease a large bowl and add the dough. Cover the bowl with plastic wrap and put it in a warm place. Let the dough rise for 1 and a 1/2 to 2 hours until it has doubled in size. Remove the dough from the bowl and punch it down so it deflates. Cut the dough in half. Cut each half into 3 pieces. Rubbing the pieces of dough between the palms of your hands, create ropes of equal length and width. 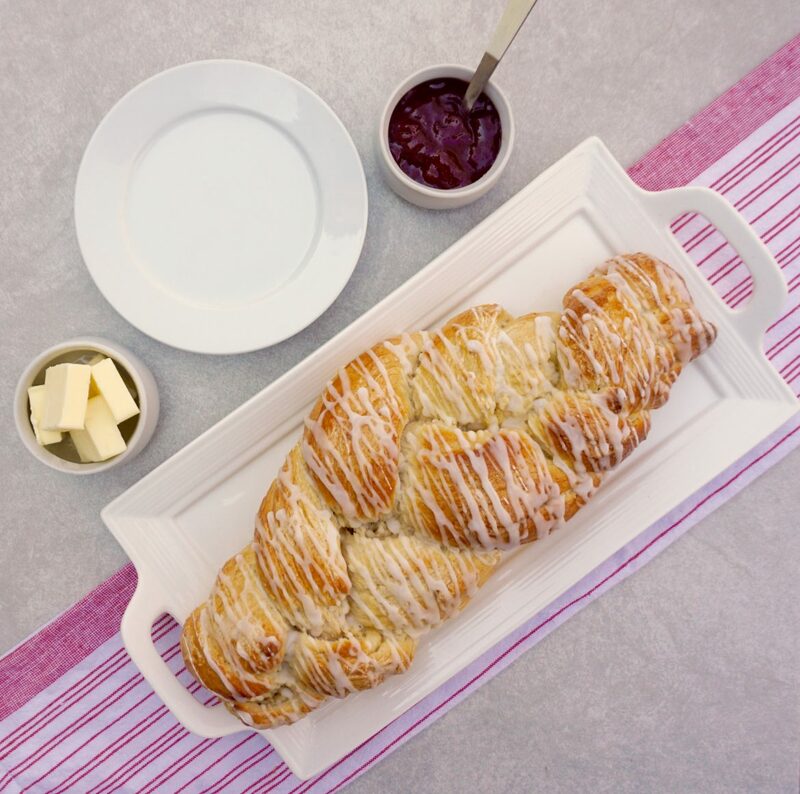 Take 3 of the ropes and braid to create a loaf. Repeat this process for the second loaf. If you are adding colored eggs, tuck them into the braids. Place the loaves on greased cookie sheets and put them in a warm place, lightly covered with plastic wrap. Let them rise until they have doubled in size, for 1-1/2 to 2 hours. Preheat the oven to 350 degrees. Lightly brush the tops of the loaves with the beaten egg and milk mixture. Bake the bread for about 30 minutes until golden brown. The bread should sound hollow when tapped. Remove to racks and cool. Combine the confectionary sugar, milk and vanilla. 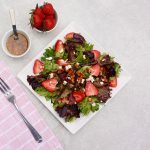 You want to have a fairly thick but pourable glaze that can be easily drizzled over the breads. If you need to thin the glaze out a bit, add more milk, one teaspoon at a time. 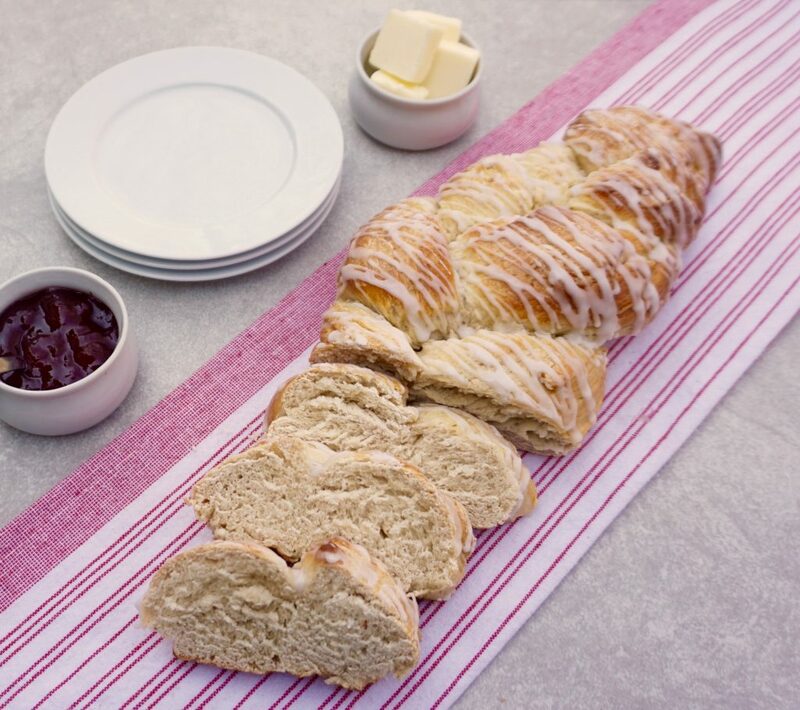 With a teaspoon, drizzle the glaze over the breads. Take the three equal strands of dough and braid the bread, tucking the ends underneath the loaf.